See also the article Voigtländer Vito C.
Vito CL is a 35mm film viewfinder camera made by Voigtländer and produced between 1961-67. It is in the Vito C series. Its specifications are similar with Vito C except the coupled light meter. All of the Vito C series models, were sold as Standard or Deluxe models. Differences between standard and de luxe models are cosmetic, like leatherette covered lens barrel, black shutter release, raised chrome name, film reminder disc with leather in the center. 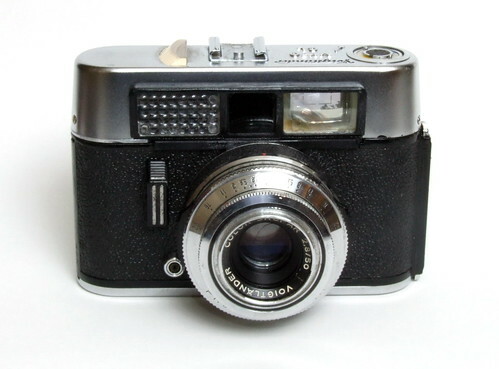 Third Model: 1963, meter needle visible on top and in finder, protruding accessory shoe, top housing taller than earlier models. Vito CL models were offered various lens/shutter combinatioons, like Color-Lanthar or Color-Scopar 50mm f/2.8 lenses in Pronto LK, or Prontor 500 LK shutters. The C series round-ended body style was produced between 1960 & 1967, after which a square-ended body was made.